Amile Jefferson has committed to Duke University, becoming the Blue Devils’ second commit in the high school class of 2012, joining shooting guard Rasheed Sulaimon. Jefferson, a 6-foot-8, 200 pound forward from Philadelphia, Pennsylvania, played at Friends’ Central School in Philadelphia. His team has made consistent appearances in the national rankings over the past few years. Jefferson averaged 18.5 points and 9.6 rebounds per game for Friends’ Central during his junior season. He led the team to its third consecutive PAISAA title and was named Gatorade State Player of the Year. One of the reasons why Jefferson is a great fit at Duke is because like many of his future Blue Devils teammates, he is not used to losing. His high school team went 75-9 in his first three years there. He recently finished the regular season for the Phoenix when Friends Central fell 55-53 to The Westtown School in the Friends School League semifinal. Jefferson led the way for Friends Central with 26 points, 10 rebounds, and two blocks. They moved on to compete in the Pennsylvania Independent Schools Tournament, where they capped off Jefferson’s illustrious high school career with a fourth consecutive state championship, finishing with a 22-5 record. Amile finished his senior season averaging 19.8 points per game and had a double-double in his team’s state title victory over The Westtown School. Welcome to the Duke basketball family, Amile. See you in August. Crazie Talk headed down to the Queen City on Saturday for the 2012 edition of the Jordan Brand Classic. This was our second straight year at the event. Last year, we had the chance to see three Duke guys play (Austin Rivers, Marshall Plumlee, and Mike Gbinije*) and a TON of other talent, including four members from Kentucky’s national championship squad this year- Anthony Davis, Michael Kidd-Gilchrist, Marquis Teague, and Kyle Wiltjer. The game featured many stars whose names we’ll soon hear called at the NBA Draft in a few months. Needless to say, we decided it’d be worthwhile to check the event out this year. We started out to Charlotte in the afternoon, luckily having better weather this time than the tornadoes we faced last year. The first game we saw in Time Warner Cable Arena, home of the 7 win & 52 loss Charlotte Bobcats, was the international game, featuring some of the best young talent from around the globe. Lucas Silva Dias from Brazil (18 points, 12 rebounds) and Federico Mussini (21 points) from Italy led the way for their team to an 89-87 victory in overtime. I was beyond thrilled to have the chance to watch a 16 year old by the name of Domantas Sabonis though, a member of the losing squad. He is the youngest son of NBA and international legend Arvydas Sabonis, who I fondly remember watching as a kid. Here’s to hoping he can make it big like his father did. Next up was the regional game featuring some of North Carolina’s finest. This game included a number of seniors committed to top programs, including Peter Jurkin (Indiana), Brandon Bolden (Georgetown), and Montay Brandon (FSU), to name a few. Outside of Brandon, there were also guys going to other ACC schools: Clemson (though Josh Smith did not actually play), Wake Forest, and Virginia Tech. The one performance that really stood out to me was that of co-MVP Montrezl Harrell. Harrell will be heading off to Blacksburg to join Seth Greenberg and the Virginia Tech Hokies next season. Watch out for him, folks. He finished with 22 points on 11-14 shooting, 12 boards, and seven blocks, a number of which came in key points in the game, including the opposing squad’s last-second shot to try send it to overtime. He has the potential to make a huge impact on both sides of the ball next year in the ACC. Around 7 PM, the All-American game tipped off. This is the one that everyone came to see. It’s the game that included the #1 and #2 players in the nation who just on Wednesday announced where they’ll be playing their college ball: Nerlens Noel and Shabazz Muhammad. It also featured four top high school phenoms who will be playing next year in the Triangle area: Rodney Purvis (N.C. State), J.P. Tokoto (UNC), Brice Johnson (UNC), and Rasheed Sulaimon (Duke). Noel, Purvis, Tokoto, and Johnson were part of the East squad, while Muhammad and Sulaimon were on the West. The East got off to a quick start, going up 10-0. J.P. Tokoto led the way early with a couple of nice finishes. He definitely looked like the most athletic player on the court, at least early on. The West’s first points actually came off the hands of Brice Johnson. Johnson must have trained with Tyler Zeller, as he tipped in a missed shot…lol. Funnily enough, those were Brice’s only “points” of the game. At times, he really seemed to disappear from the game, and he was the only player not to score in the game. And despite Tokoto’s strong start, he didn’t do much in the second half, finishing with only 8 points, all of which came in the first 20 minutes of the game. The first half, though, was very sloppy. It reminded me quite a bit of the Nike Hoop Summit just one week before, in which the U.S. squad of many of these players was beaten by a team of international phenoms, including Duke recruit Andrew Wiggins. At the JBC, the teams combined for 22 turnovers in the first half and shot 1-19 from 3. A bright spot in that stat line was that the lone three came from future Blue Devil Sulaimon, who finished the half with 7 points and 7 rebounds. A number of players made themselves known in the second half though with some solid play. Alex Poythress (Kentucky commit, former Duke recruit) finished the game with 16 points on 7-8 shooting. In the end, Sheed’s squad won the game 99-95. The two MVPs were Shabazz Muhammad (20 points) and Rodney Purvis (22 points). Muhammad’s had an impressive stretch here against some of the nation’s (and world’s) best. He recently was named MVP of the McDonald’s All-American game and also became the all-time leader in points scored in the Nike Hoop Summit after his 35-point performance. As he announced last week, he’ll be heading off to Westwood next season, choosing UCLA over Duke and Kentucky. Purvis and Sulaimon were definitely going at it throughout the game. You could see a little competition brewing between the two. It’ll be interesting to see what happens when they meet again in conference play in the upcoming season. Sulaimon, for the most part, played well. He finished with 13 points, 7 rebounds, and 2 assists. He did have 4 turnovers though, many of which came on some poor decisions and off-target passes. It’s important to note that he was playing out of position in this game. The West team was playing without a true point guard, and so Rasheed, a natural 2-guard, took on many of those duties. (Quick aside: UNC-bound Marcus Paige was supposed to carry that role, but he was absent from the game, recovering from foot surgery.) The future Duke guard was 3 of 6 from beyond the arc and showed clutch play down the stretch, hitting a big 3-pointer in the game’s closing minutes. 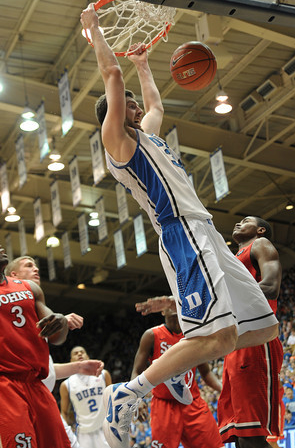 He seems like a great guy who is just excited to put on that Duke jersey and play his heart out each and every game. You can’t hope for a young man much better than that. Another senior in the game was Tony Parker, a Duke recruit from Georgia who has been on Duke’s radar for quite some time. He’ll be deciding between Duke, UCLA, Kansas, Ohio State, and UGA on Friday, so be on the lookout for that announcement. After the game, he did say that playing for Coach K and a school like Duke with so much rich basketball tradition and great academics is a draw for him, so that does give us a glimmer of hope. 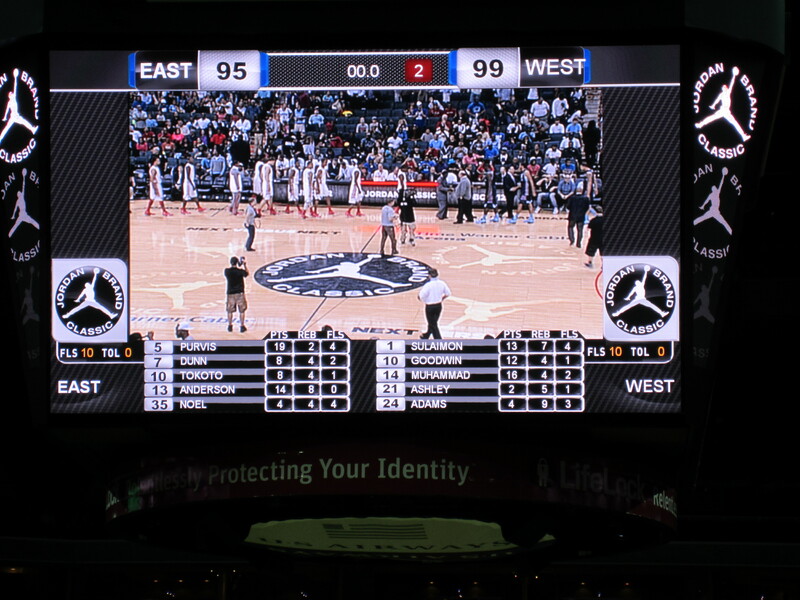 Well, that’s it for us at the Jordan Brand Classic. Got questions or comments on anything we said? Let us hear them! 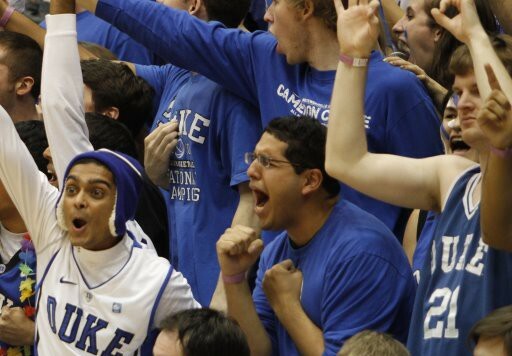 *We’re hearing reports that Michael Gbinije is to transfer from Duke. If that’s the case, we wish him the best of luck wherever he ends up. Thanks for the one year! Stay alert for any updates on this developing story. 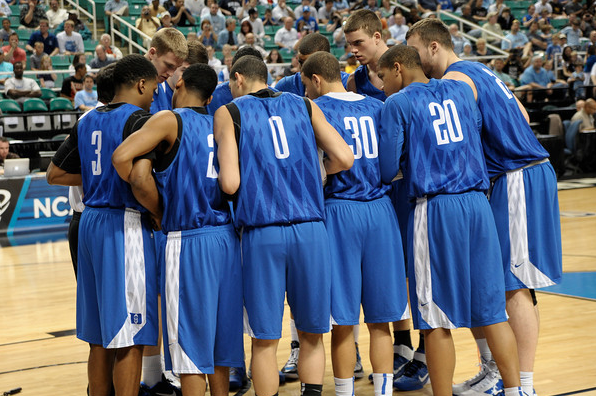 Duke fans woke up to some terrific and unexpected news on Monday morning, just two days before the Tar Heels visit Cameron for the first Battle of Tobacco Road of 2011. Alex Murphy, a highly touted 6’8” small forward from St. Mark’s in Southborough, Mass., gave the Blue Devils a verbal commitment, picking Duke over scholarship offers from Kansas, Florida, Villanova, and yes, North Carolina. 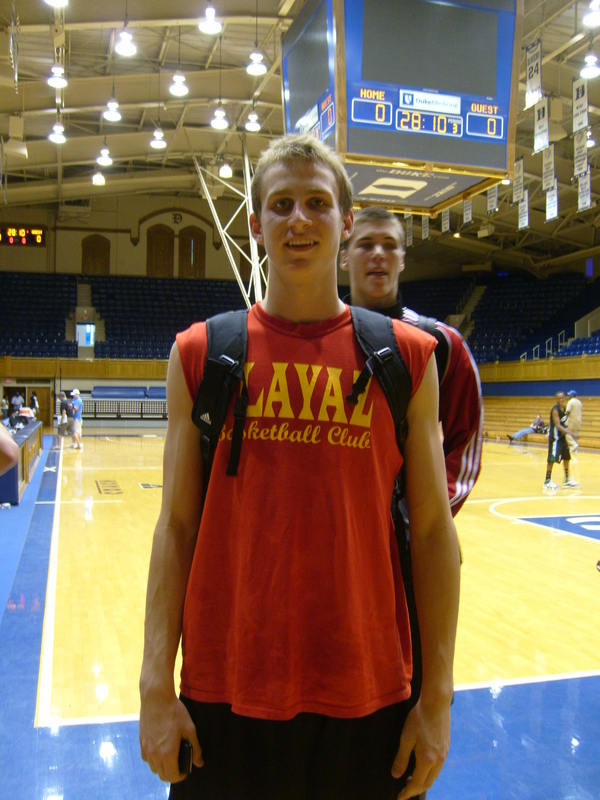 Murphy is the first player in the high school class of 2012 to choose Duke, and his commitment helps keep Coach K’s recruiting hot streak going strong. 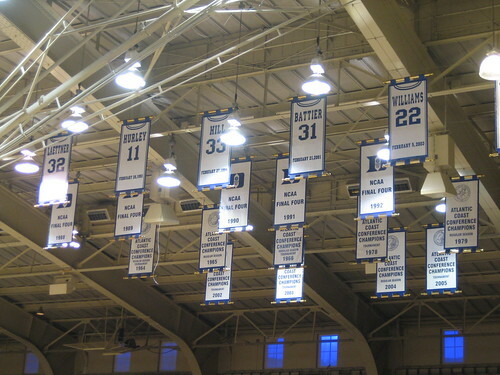 Conveniently for Blue Devil fans who don’t pay much attention to the rest of college basketball, Murphy’s most appropriate basketball comparisons come from inside the family. Two of his favorite players are Kyle Singler and Mike Dunleavy, Jr.—lanky small forwards with shooting range, high basketball IQ, and deceptive athleticism—and Murphy emulates them on the court. When C-T saw him play last summer in the Bob Gibbons Tournament of Champions, we noted Murphy’s fearlessness in going to the hoop with either hand, activeness on defense, and ballhandling abilities. Add to that list the ability to dunk over seven footers and posterize Indiana commitments and you have an inkling of what Murphy will bring to Duke. While it’s clear that he needs to improve his strength (which he admits himself), Alex has all the natural talent required for big time college basketball. He’s ranked in the top 20 by most recruiting services, and it’s likely he’ll continue to improve in the next year. If there’s any lingering feeling that Coach K is slipping on the recruiting trail, Murphy’s choice—which came pretty early in the game—should put those fears to rest. After picking up blue chippers Austin Rivers, Quinn Cook and Marshall Plumlee since the 2010 National Championship, it is clear that high school players—ever trend followers—think Duke is hot right now. Our continued dominance of the ACC and another big run in March will help solidify our rep. The 5-stars will come running. Enjoy the filthy highlights of Alex Murphy from One Entertainment below. Welcome to Duke, Alex. It’s Heel Week, everybody. Check back tomorrow for the sequel to the legendary “10 Questions for Ed Davis and Co.” YEEHAW!